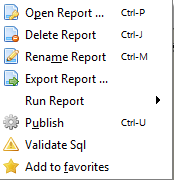 In NextReports 6.1 a new Favorites Menu can be found. Favorites are for NextReports what are Bookmarks for a browser. Practically, when a favorite is clicked, NextReports automatically connects to entity (report or chart) data source and the entity is loaded inside designer. At the end of these links a "Remove favorites" action allows to manage favorites list.